A telephone call from a local parishioner to the resident pastor at Claremont, Rev. George H. Smith, in January 1945 began the process of forming a mission parish in West Concord. The families living in the surrounding area were in need of a more convenient location for Sunday mass. With the approval of Bishop Leo Binz of Winona and Fr. George Smith and the financial support of surrounding parishes a former store in town was renovated to serve as a chapel. Fr. Smith of St. Francis de Sales Catholic Church of Claremont offered the first Mass on March 4, 1945. 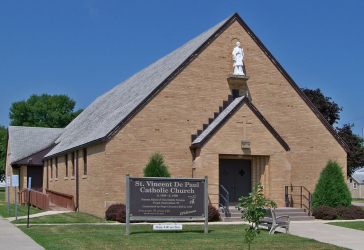 The parish was placed under the patronage of St. Vincent de Paul, the Apostle of Charity, and was incorporated under the laws of the State of Minnesota on September 4, 1945. In 1946 the Ed Tracy family donated nine lots to the south of their home. The plans for the new church were approved and ground was broken on July 24, 1951. After seven years of planning, fundraising, and hard work, the first Mass was offered in the new church by Fr. W. D. Sullivan on Pentecost Sunday, June 1, 1952. Bishop Fitzgerald dedicated the parish, consecrated the altar, and conferred the Sacrament of Confirmation on July 20 of the same year. On January 24, 1955 a three acre area parcel of land north of West Concord was purchased and a cemetery was developed. Parishioners planted evergreens at the cemetery laid out in a cross formation. From 1945-1965 St. Vincent’s was considered a mission of St. Francis de Sales, Claremont, with the Pastor residing in Claremont. Yet, in 1965 construction of a rectory and hall began. Our first resident pastor started in 1966. Between 1973 and 1975, the sanctuary of the church underwent a major remodeling. At this same time the St. Vincent Cemetery Association was formed as well as the first Parish Council in 1974. During the 1970s to the present, St. Vincent’s has been active in MCCL (Minnesota Citizens Concerned for Life) and various pro-life activities. In the early ’80s, the St. Vincent Council of Catholic Women was formed. Fr. Douglas Gits was assigned pastor of the parish in Dodge Center in 1987, then Claremont in 1988 and finally, in West Concord in 1990. This clustering coincided with the combining of these three school districts the same year completing the “Triton Catholic Parishes.” This left St. Vincent’s former rectory to become a Parish Center with the upstairs rooms becoming the office of the secretary and bookkeeper, and classrooms for religious education. In response to our aging population and their increasing needs, a St. Vincent Helping Hands Prayer Shawl ministry group was formed to visit and serve the sick and needy in our communities. In 2010 the Knights of Columbus Order was restored to our parishes having been previously active in the 1950s. On October 1st, 2016, St. Vincent’s became an oratory as part of the Vision 2016 Pastoral Planning process. The transitional Mass was held September 27th on the feast of St. Vincent de Paul – Bishop Quinn presided with Fr. Nguyen, Fr. Niehaus, Fr. Thompson, Fr. Farrell, and Fr. McNea.